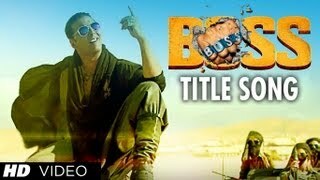 Here is the title song lyrics of BOSS movie which is sung by Honey singh ,Anjjan and Meet Bros.
Boss is an upcoming bollywood movie starring AKSHAY KUMAR . Boss song lyrics is penned by Kumaar. Music composed by Meet Bros and Anjjan.This song is picturised on Akshay Kumar. Make way for the Boss!! Oh mother father listen up! Hum toh hain duniya ke Boss!